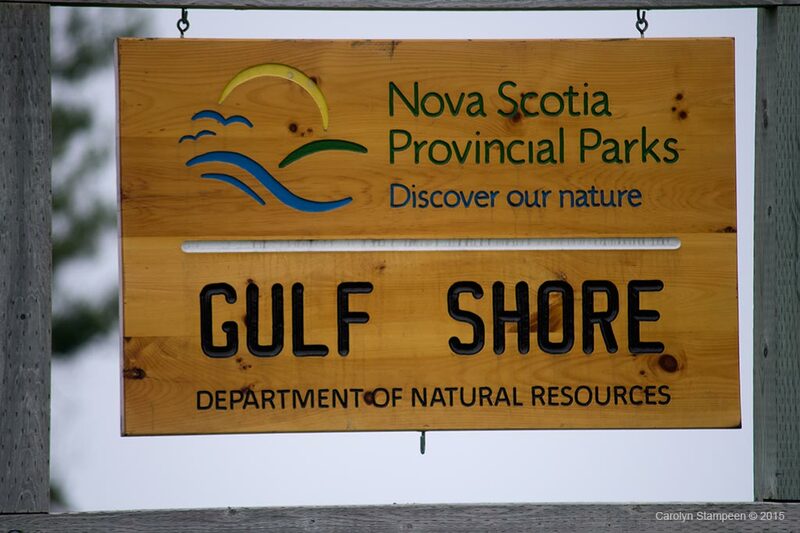 The Gulf Shore Provincial Park is, at first glance, an unassuming little park along the Gulf Shore Road, not too far from Pugwash. 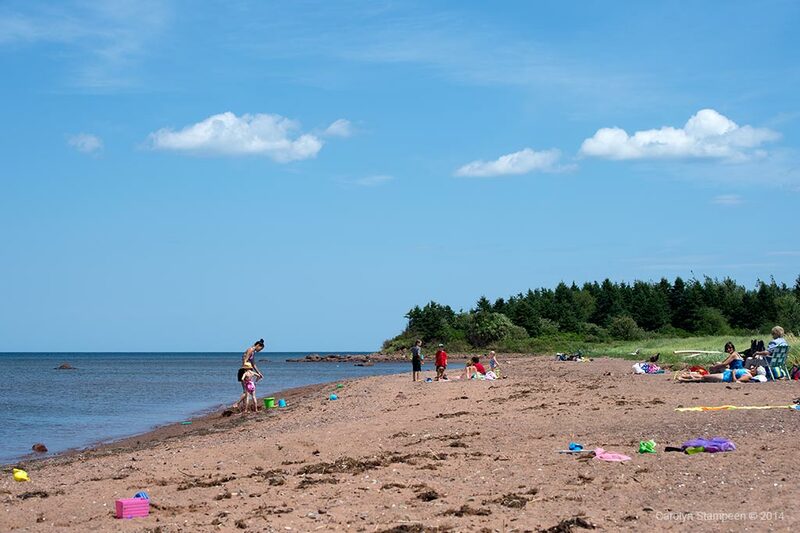 It has amenities such as washrooms, picnic tables, plenty of parking and there is a little walk through manicured grass to the beach at the bottom of a gentle hill. That being said, it is a wonderful spot for many reasons. Like a sandy beach? You’re covered. 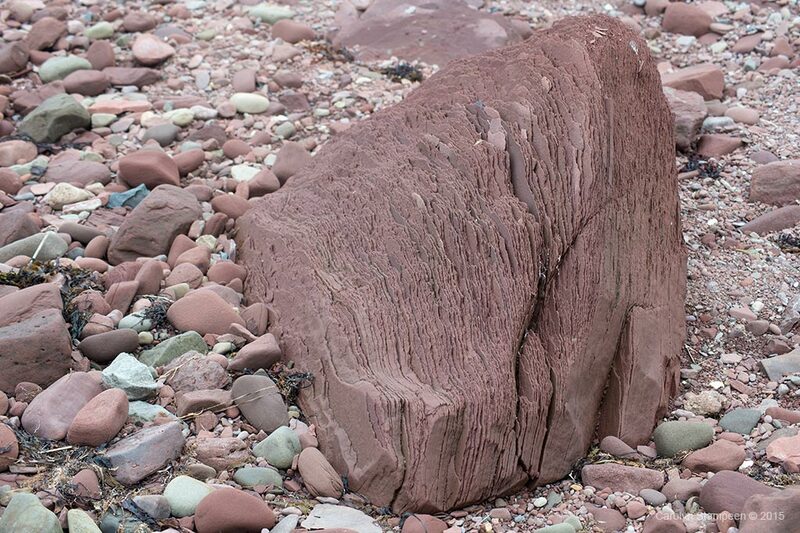 Like walking along rocks? There’s that, too. 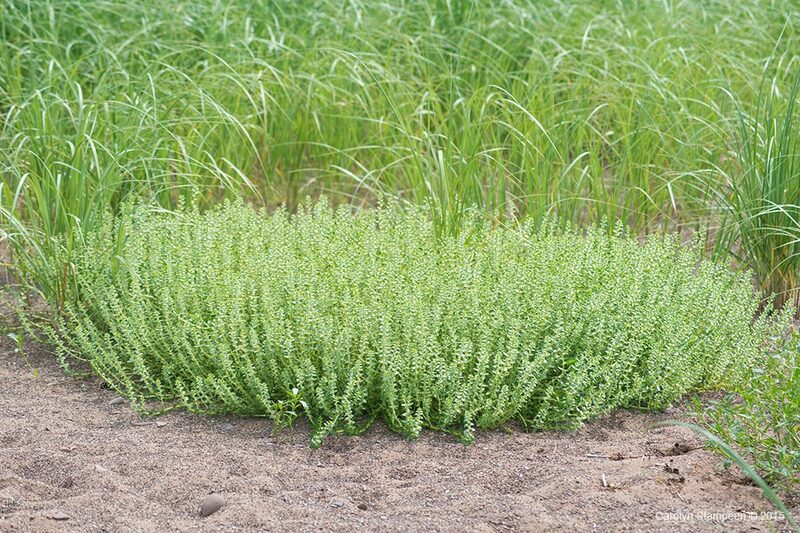 Enjoy dune vegetation? Check. Want to swim? Check. 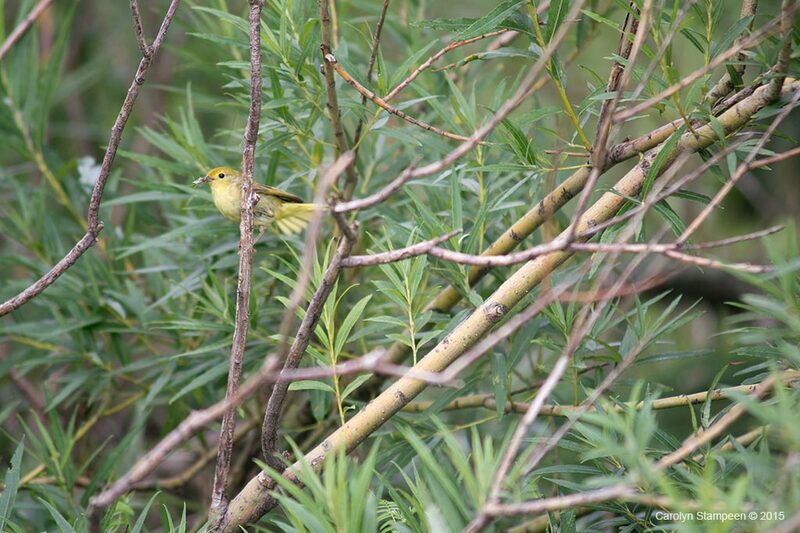 Enjoy watching warblers, butterflies? Yep. 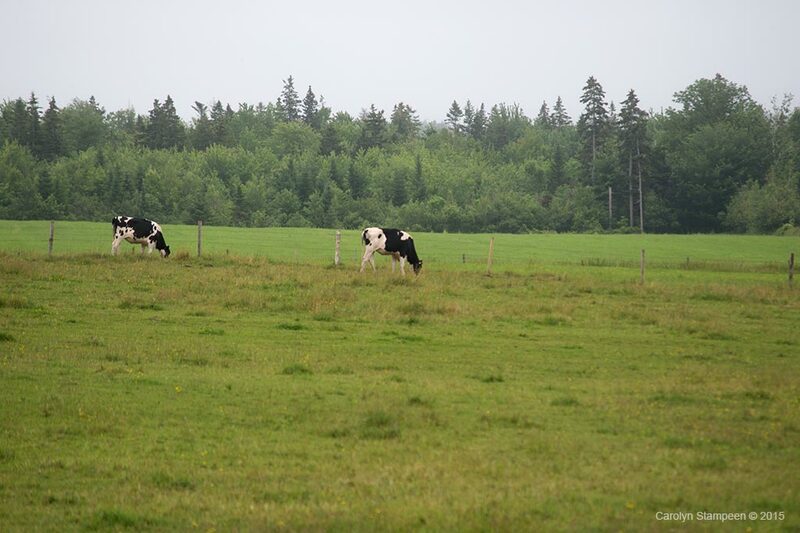 Are pastoral scenes, complete with barns and cows, something that bring you inner peace? Just park your car here (so you are safe, not being a traffic hazard) and just walk along the road. 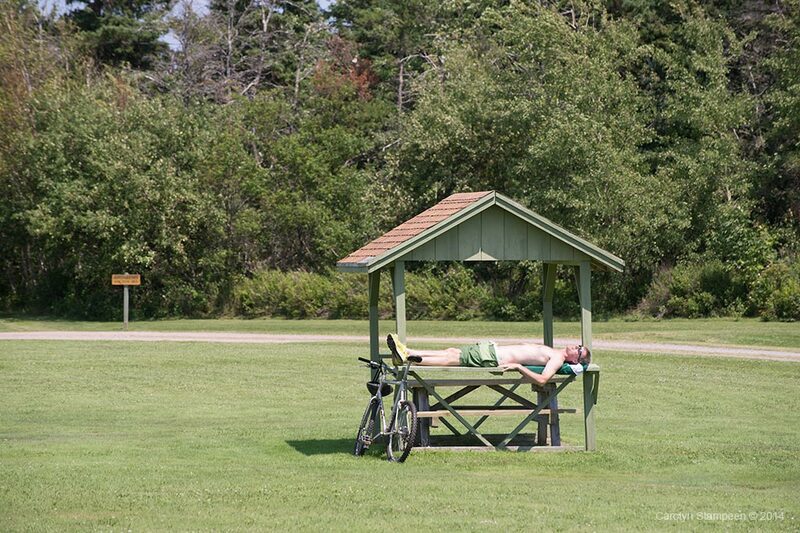 A bicyclist takes a relaxing break on a covered picnic table on a very hot day. Taken near the parking lot, looking towards the water. There is a big grassy area, great for a game of frisbee. The ocean breeze on a hot day is quite wonderful. 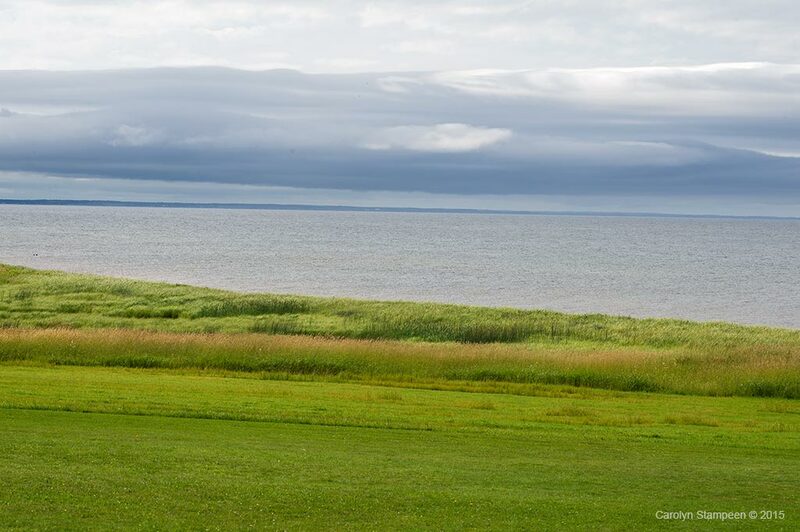 Even cloudy days here are beautiful. Take this sign seriously. 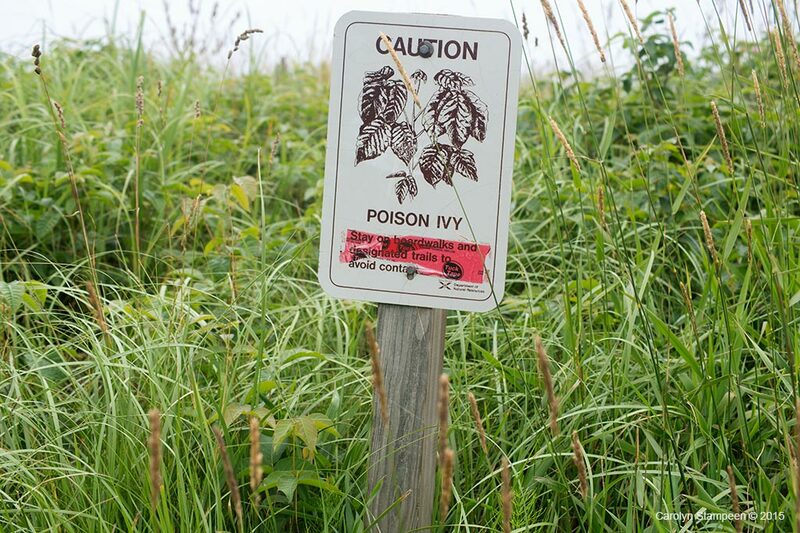 Poison Ivy grows right up to the edge of the cleared path to the beach. I didn’t notice any on the beach or in the cleared areas, but if you are sensitive or concerned, consider wearing footware through this path, just in case. 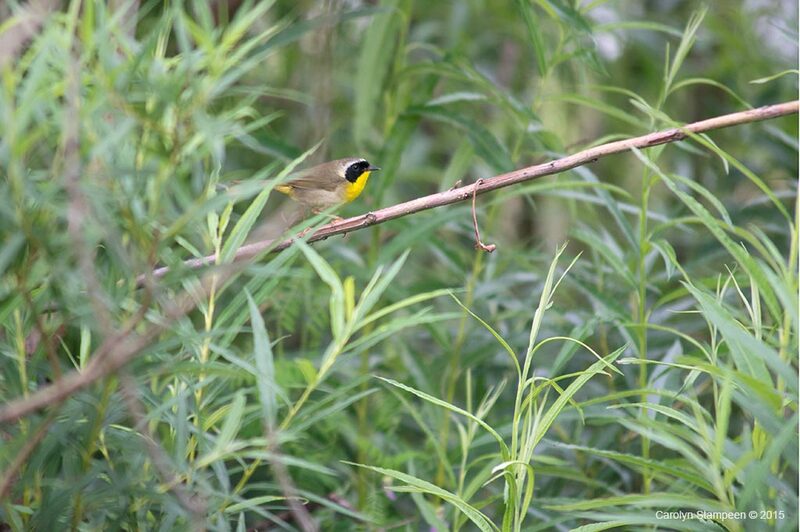 A Common Yellowthroat greeted me along the path to the beach. As one walks to the right when getting to the beach, there is a mix of dune, marsh, treed areas that seems to be a happy place for these warblers, as I could hear them calling out their territories as I walked along. A warbler bringing lunch to a hungry fledgling. 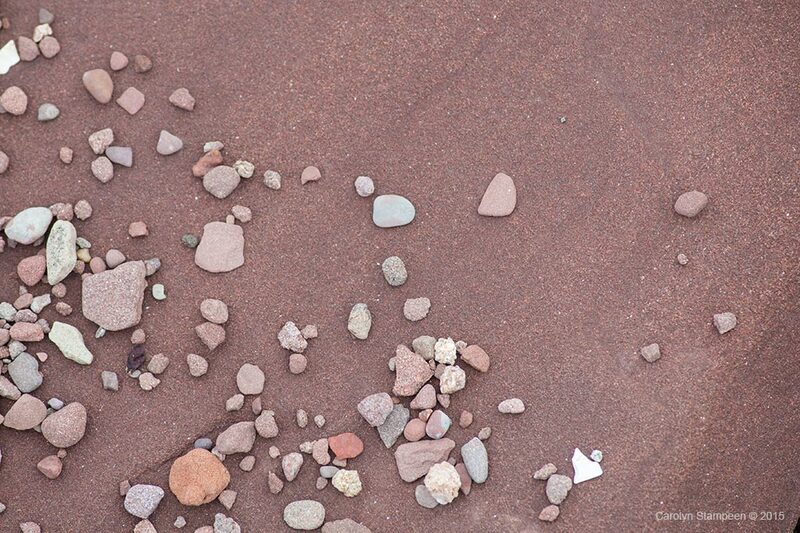 There are some pebbly parts to the beach, but there is also lovely sand as well. 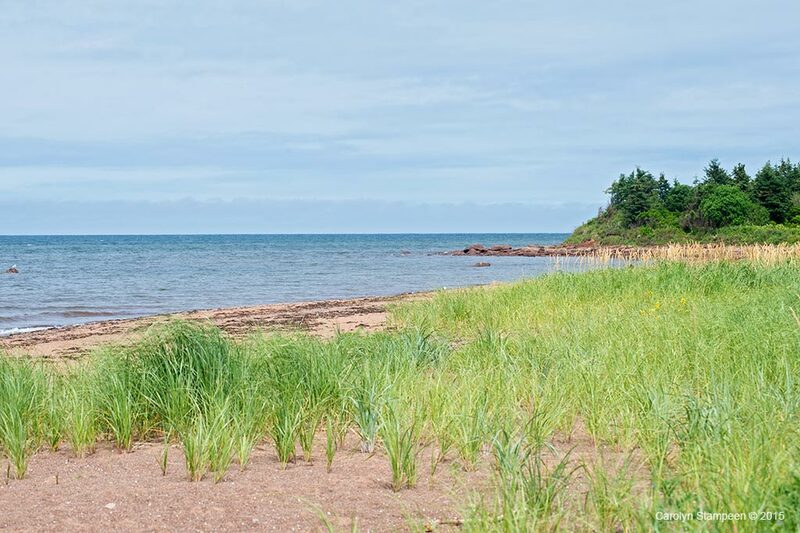 There are some shells to be found, if you love beach combing, though there are other activities here that might be more satisfying. 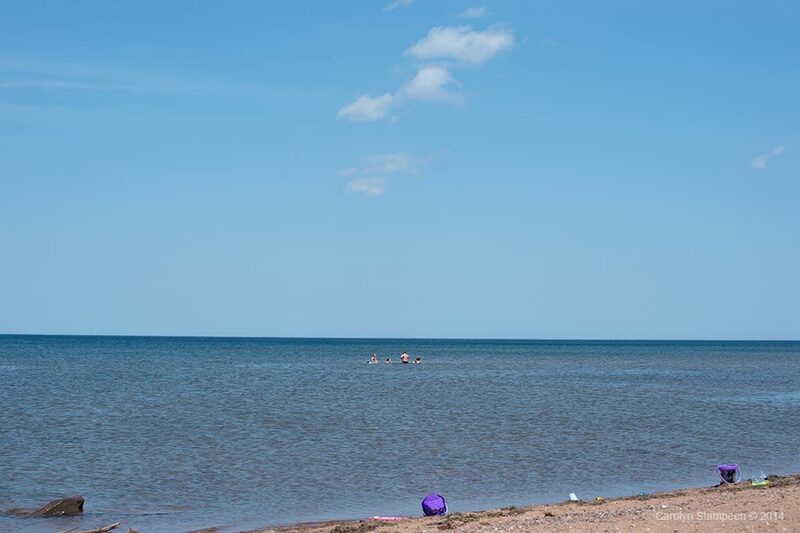 I haven’t been here at low tide yet, but either this family found sandbar or this beach is shallow, which would make it ideal for wading. 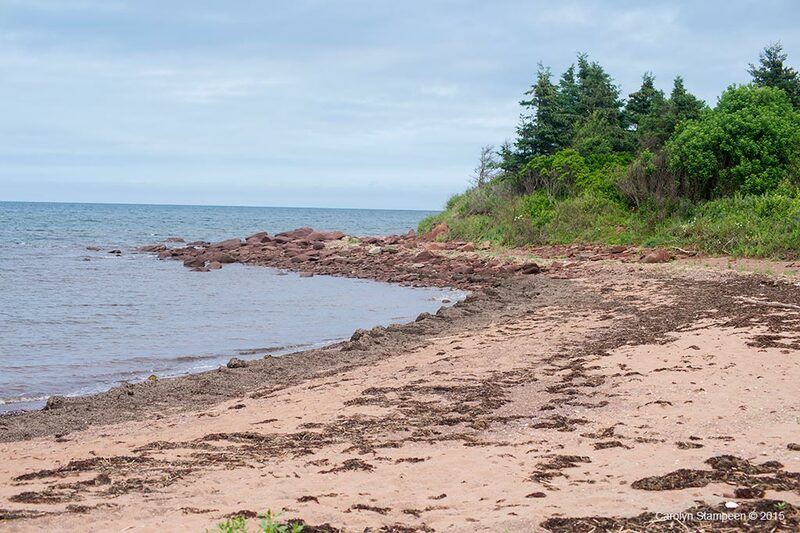 Don’t let the seaweed fool you: the sand underfoot here is a pleasure to the feet — unless the sun is out. Hot days make hot sand, which make bare feet “dance.” Consider some footwear, just in case. That point? We’re coming to that. 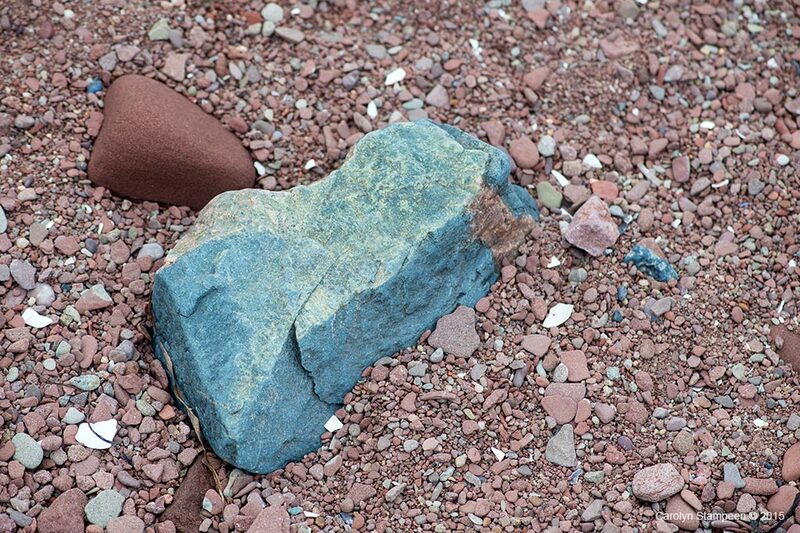 It is rocky there and beyond. 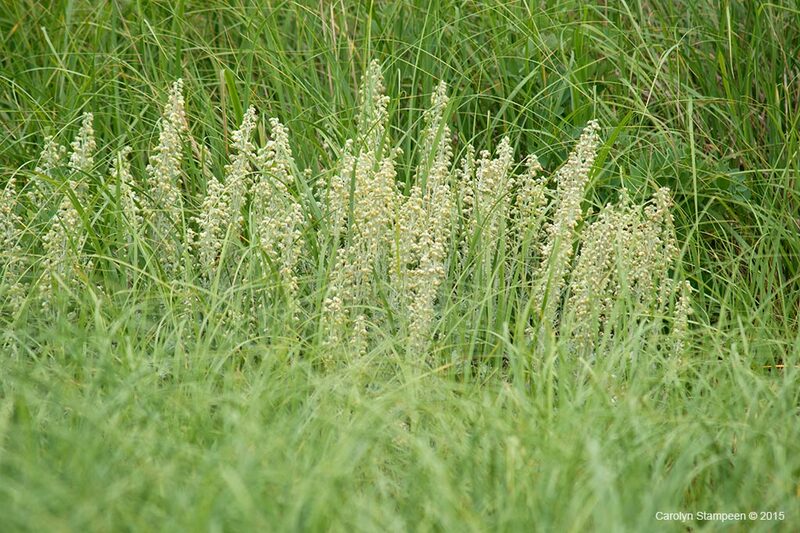 Be careful walking around this grass: it can hurt your feet and you can damage the plants. 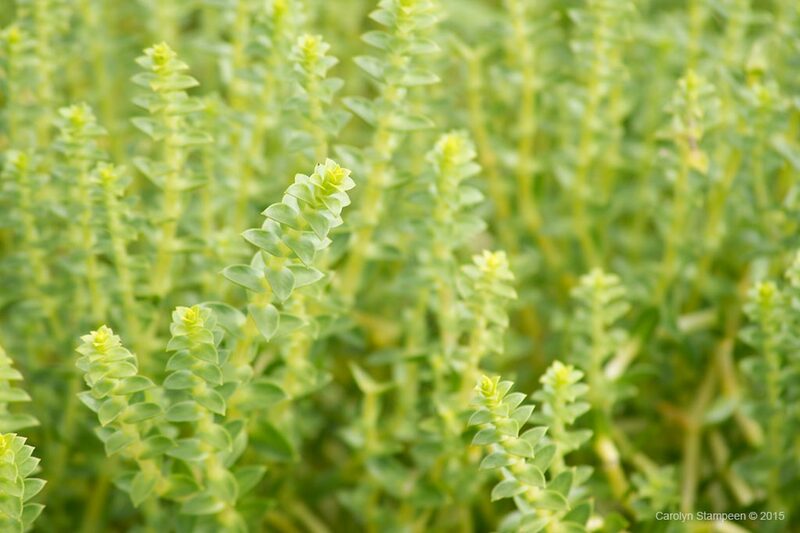 There is some interesting vegetation. Take pictures, leave plants to live out their lives. 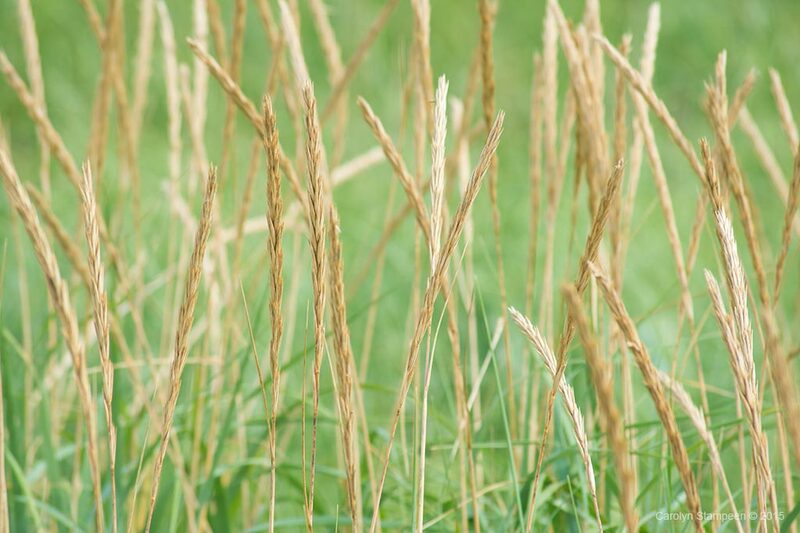 I love this golden grass. The rocks! 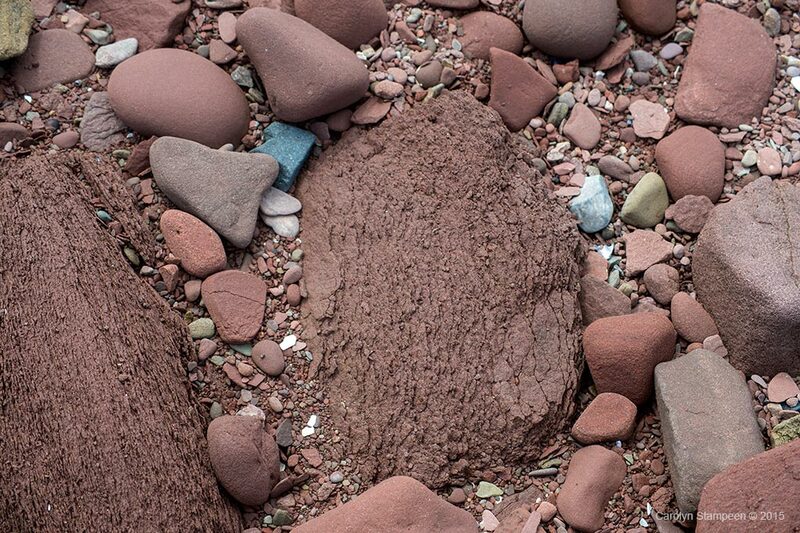 Lots of shades of brown on this beach. 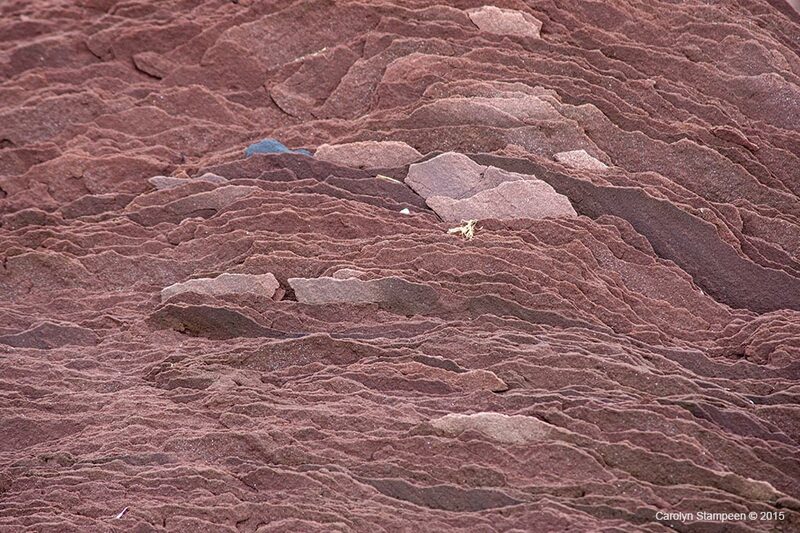 Think of the geological upheaval to have created these layers to be at such different angles! 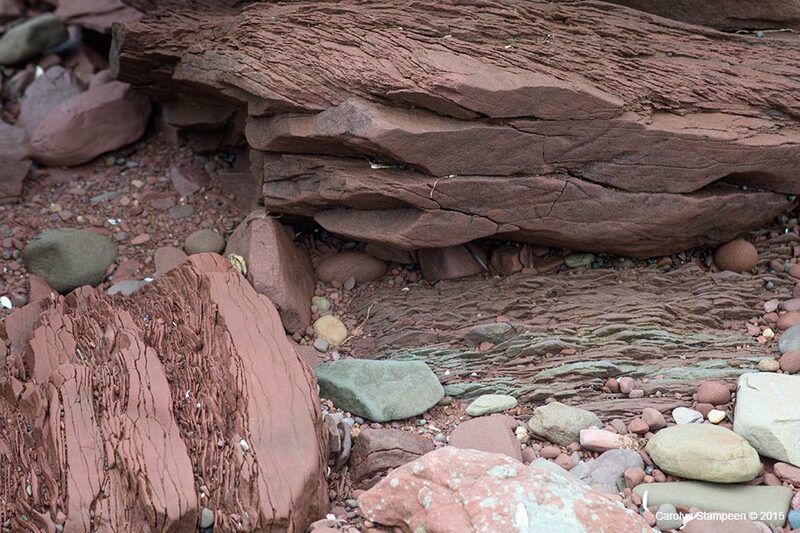 If you have the opportunity, a visit to the Fundy Geological Museum is an interesting use of time. It’s not a large museum, it’s not expensive, but there is a lot packed into it, with a lot of exhibits, some fun things for kids, and staff on hand who can answer questions. 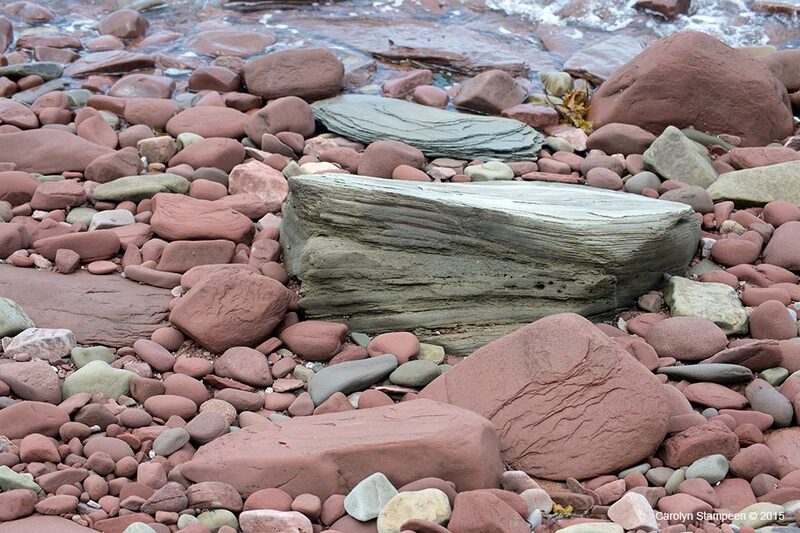 Nova Scotia has rocks from all the geological ages and has seen a lot of violent geological upheaval. 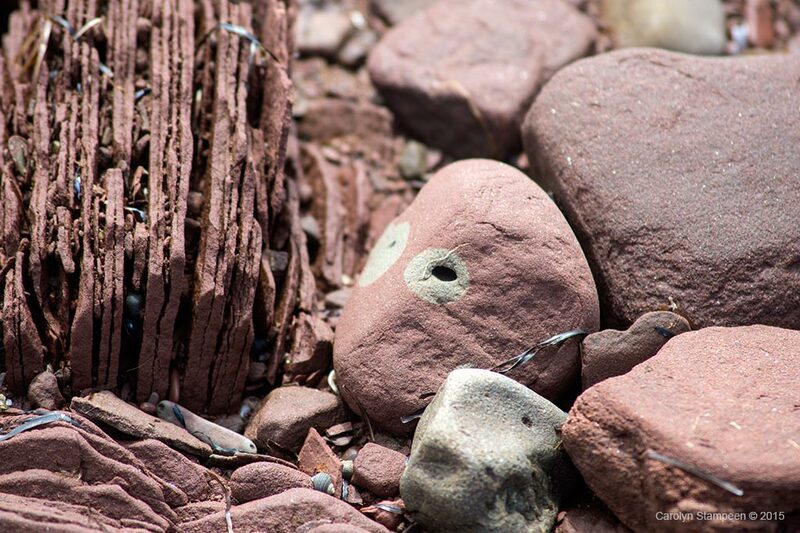 The rocks we see on beaches often hint at lots of stories that are fascinating to discover. 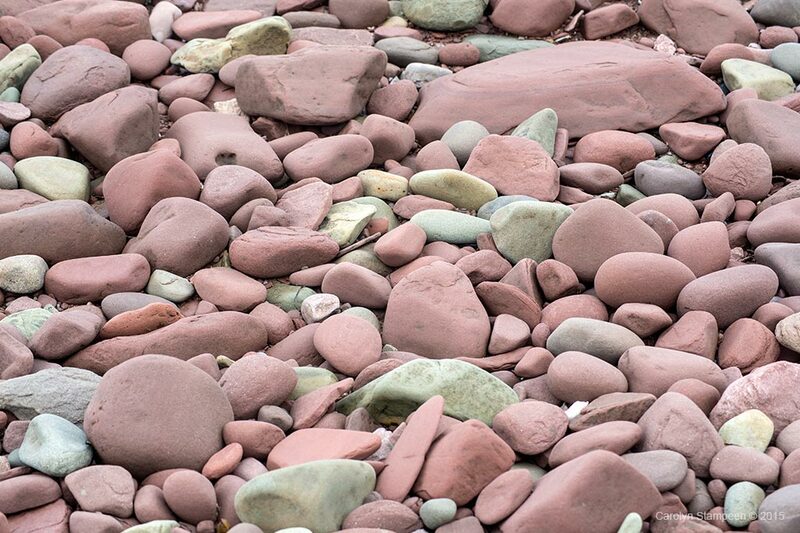 Blue rocks stand out on this beach! An unexpected find and a wonderful tribute. 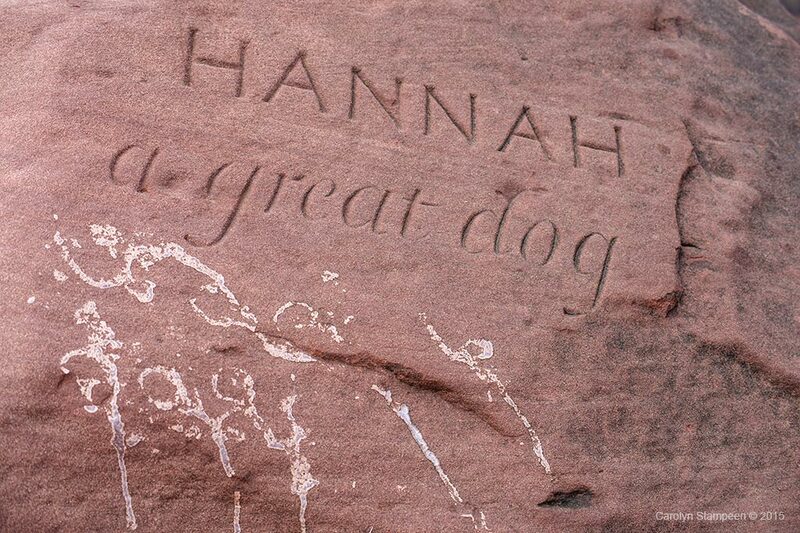 I imagine that Hannah and her human had many wonderful walks along this beach. I noticed a number of what seem like rock spirits. As for those pastoral scenes? Red against green is always striking. 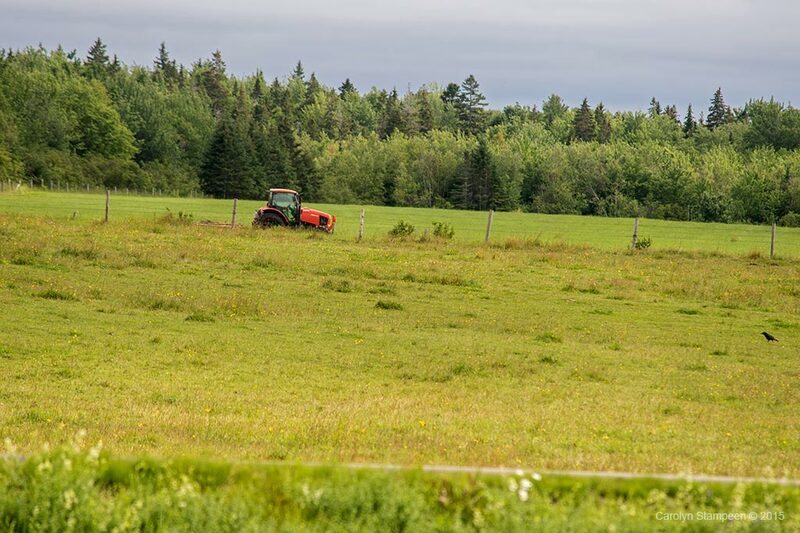 I’m sure that farmers laugh at the notion of cows being photogenic, but a tip of the hat to those farmers (because we need them) and a nod to your barns, pastures, and farm animals! 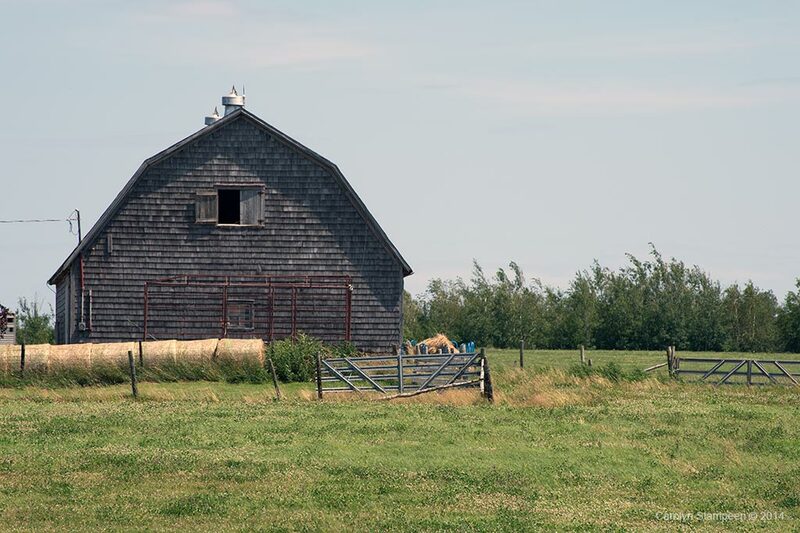 This barn, along with the cows seen in the image above, are right across the road from the park. 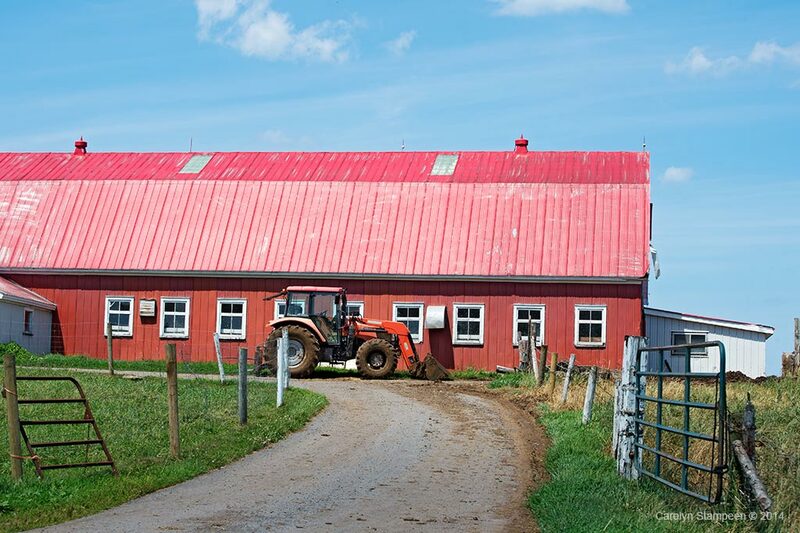 This red barn is just down the road. Imagine this in better lighting!!! Photos in this blog are often from wandering around and the time of day is just the time of day.